Saturday, February 25, 2012 through Thursday March 22, 2012-Las Vegas, Nevada-PART #2: After 14 days on a Nellis AFB partial hook-up site where we had electric and water but no sewer connection, we were able to move to a full hook up site. During our 14 day stay at the previous site, we only had to dump our tanks once, on day 10…..which is about average for us. However we did make frequent use of the very clean and convenient bathhouse. As luck would have it, the word that a site was available was one of the weekends we had the kiddles…..so we made a big adventure out of it. With their help the move only took twice as long, but was a heck of a lot more fun. The Air Force base has a lot to keep a 5, 7 and 65 year old kid entertained and since we were chaperoned by Kit no one became lost, overly cranky or got into any trouble…..for the most part. 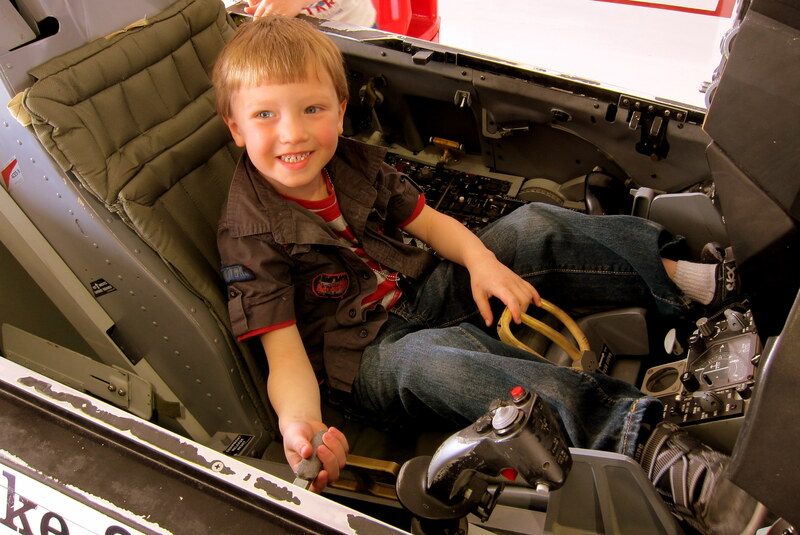 One of the must see’s, according to all three kiddles, was the USAF Thunderbird Museum and Maintenance Hanger. The team was at their home base of Nellis preparing for the upcoming show season. We were able to have a guided tour of the museum, witness some of their ceremonial activities and watch a few of the planes get serviced. 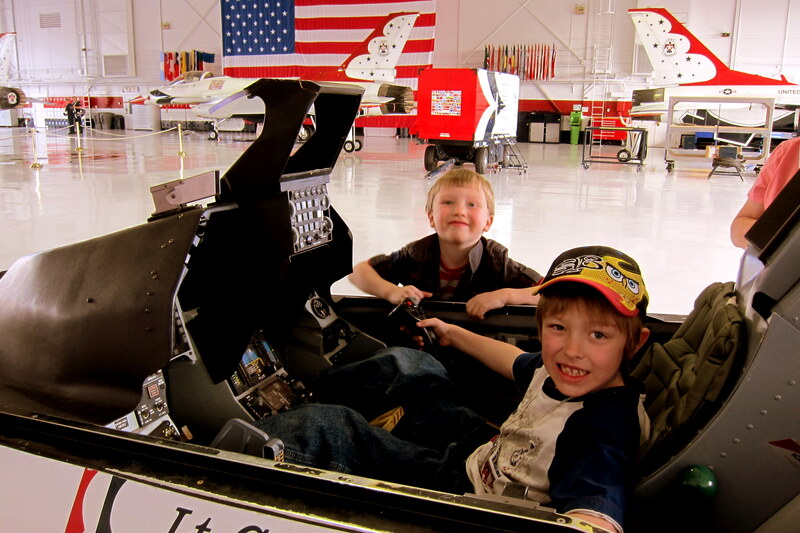 Both the younger kids were able to spend some time in the cockpit trainer…..first older brother Jack had a turn and listened intently as the Technical Sargent explained all the controls, switches and gauges. Then Tucker hopped in and immediately started pushing, pulling or turning anything that would push, pull or turn. All the while making jet noises and wearing an ear to ear smile. Tucker would have spent days in that cockpit if we had let him…..he was none too happy about being unceremoniously ejected. 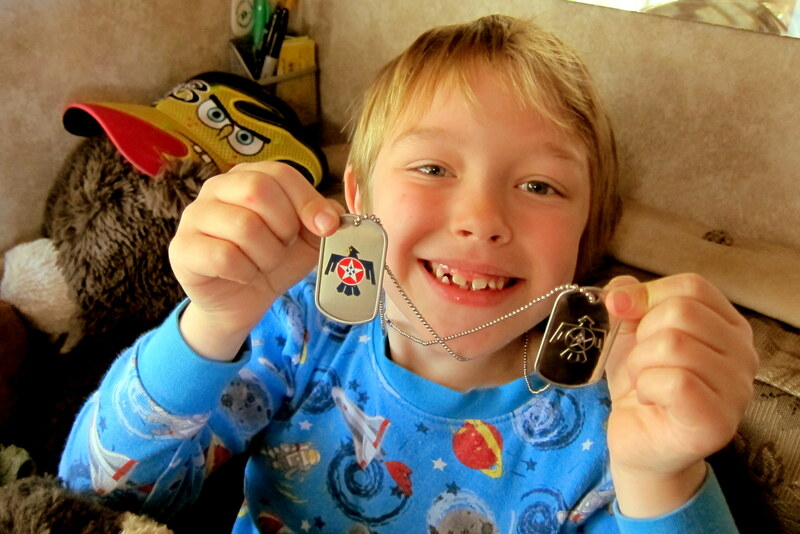 All three kids scored some nifty souvenirs…..photos, patches, booklets and authentic Thunderbird dog tags. Here Jack displays his dog tag alongside the one he acquired during our visit last year. 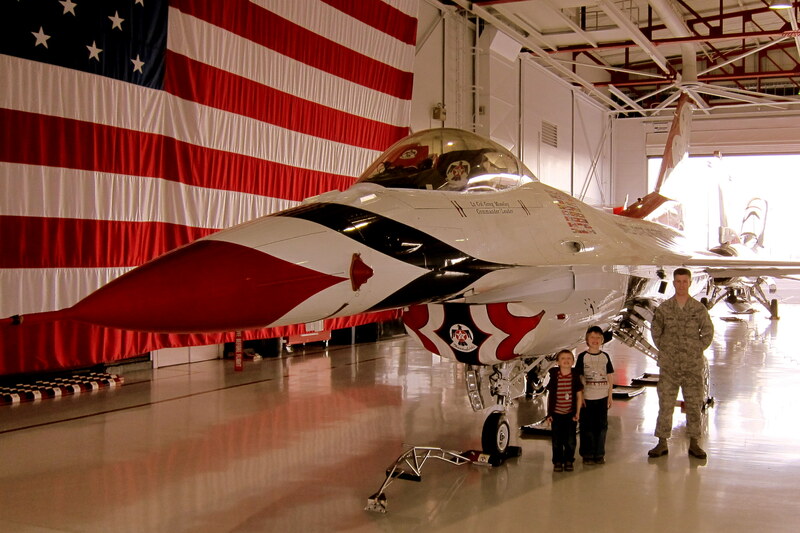 The Thunderbirds are coming to our hometown in Maine this August and everyone on the team that we talked to was looking forward to the trip. Being on a military installation there is military protocol that active duty service members must follow and civilian visitors are advised to as well…..one of these is evening colors when the American Flag is lowered. Generally what happens is there is a bugle call signifying “call to colors”, followed by the playing of the national anthem. All activity on base stops and either a hand salute is rendered or ones hand is placed over the heart, as appropriate. Since the weather was great and we were usually outside when evening colors were held, we taught Jack and Tucker the proper flag etiquette. We only had to show them once, and when they heard the bugle they immediately stopped playing and stood facing the music while placing their hand over their heart. Now the kids normally slept in most mornings…..a good sign that we had successfully kept them busy and basically wore them out. However, one morning at 0630, a bugle sounded reveille, a different call altogether. Tucker leapt up, yelled “Poppy the music”, and stood at attention on the bed and in his pajamas with his hand over his heart. I followed suit while Guma and Jack snoozed on. I didn’t have the heart to explain that he only had to do that when outside and then only when colors are being held. The base has a number of playgrounds that we frequented. 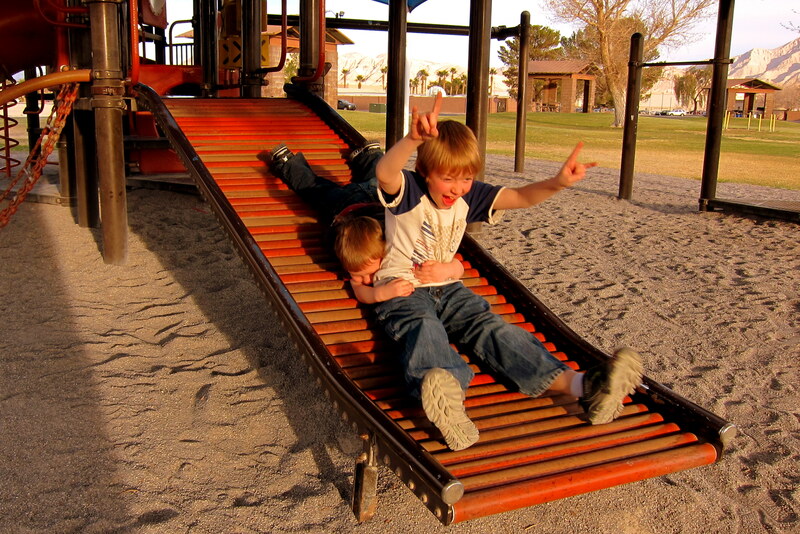 The kiddles favorite was in Freedom Park and included what they called The Rollie Slide. With active and adventurous youngsters, occasionally someone gets hurt. Tucker contracted a boo-boo while at the playground and needed medical attention by Guma when we got back to the camper. Trouble was that he couldn’t remember which finger got hurt so she covered all the bases. 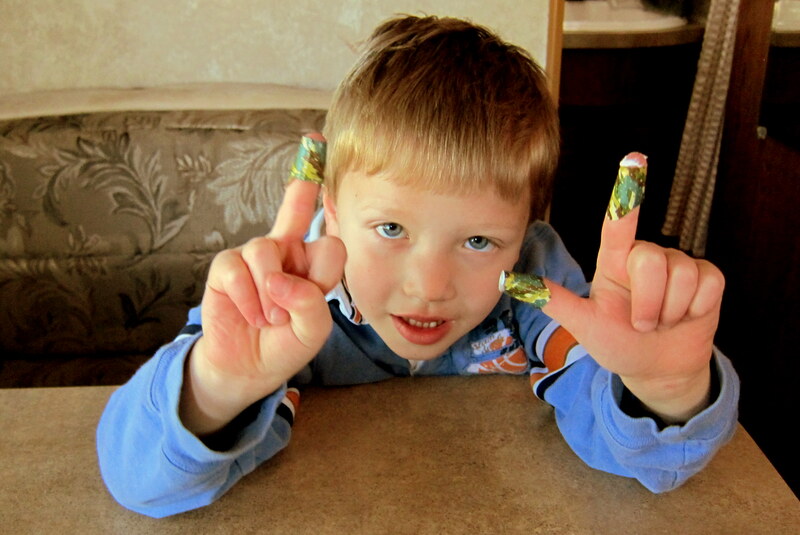 We think the bandage on the right middle finger was so he could spend the rest of the day going around saying: “Wanna see my boo-boo”. And the two bandages on the left hand made his “finger gun” more authentic. Last week while poking around the vast complex of Las Vegas International Raceway, I came across a large building that got my attention. That’s the world headquarters of Shelby American, Inc. Any car nut can tell you about Carroll Shelby and his AC Cobra sports car which he built in 1962. 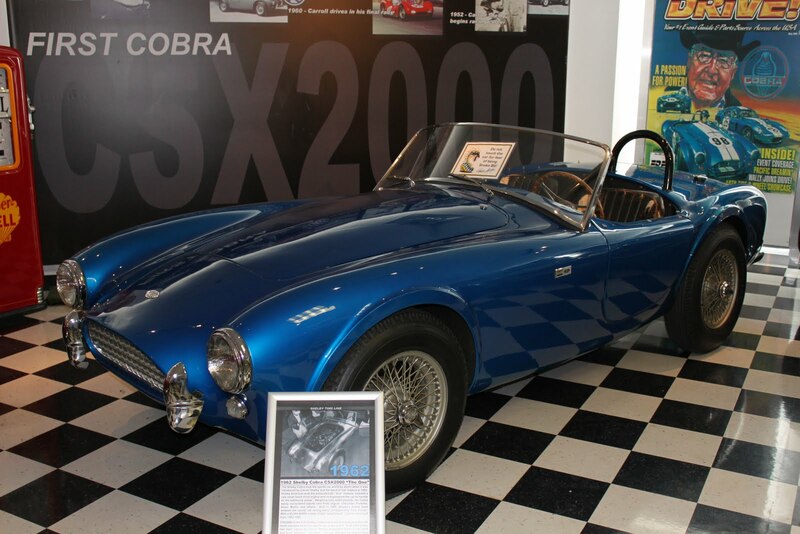 There is a small museum inside that showcases these iconic automobiles…..below is the first AC Cobra ever built and raced. Carroll, being a Ford man wanted a car that could compete with the Chevrolet Corvette in sports car racing. So he built one by taking an English AC Bristol, removing the anemic engine, while re-engineering the suspension, brakes and drive train. Then he shoehorned in a Ford 260 cubic inch (CI) V8 engine that was modified to produce 335 horsepower (HP). All in a 2000 pound car! In order to qualify for production sports car racing, 100 cars had to be produced for sale. 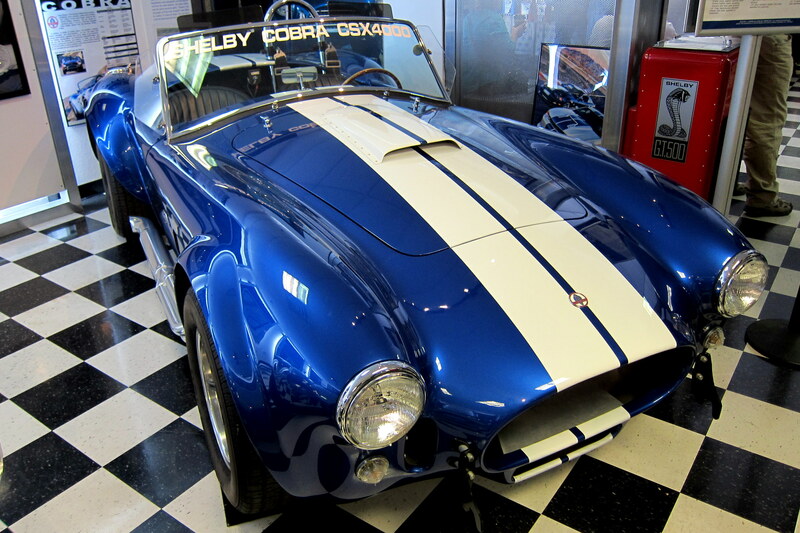 Between 1962 and 1965 a total of 655 Shelby Cobras were manufactured and sold for an MSRP of $5,995.00. Today those original cars are going, at auction, for a million dollars plus! Then in late 1965, Carroll Shelby started installing Ford 427 CI engines producing 485 HP in these little cars. He had the bodies custom fabricated out of aluminum and used a racing chassis and associated components. A number of these hot little cars were fitted with a windshield and horn…..then sold as street legal machines. One was bought by the comedian Bill Cosby, who quipped “this thing goes 200 miles an hour…..in reverse”! 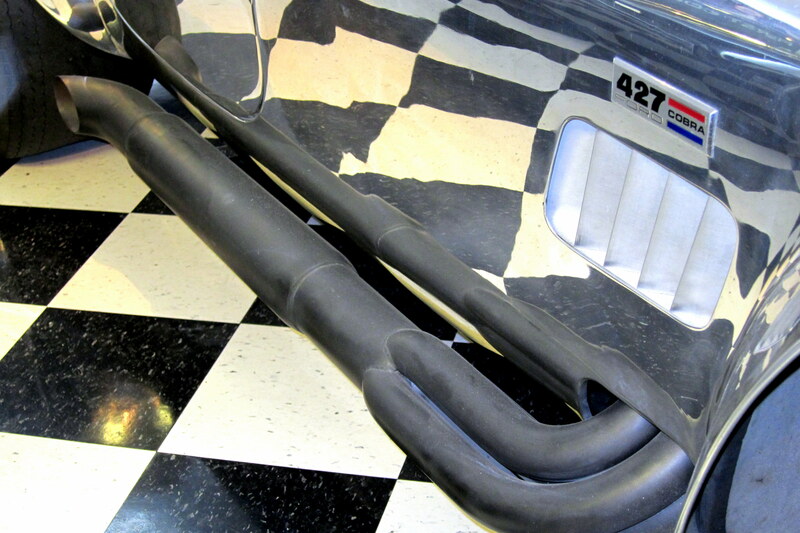 This 427 upgrade increased the cars weight by 300 pounds and the MSRP by an additional $2000.00. Since only 348 cars were ever built, and the horsepower to weight ratio was among the best in the world, these cars are now selling for many millions of dollars, if they ever come to market. 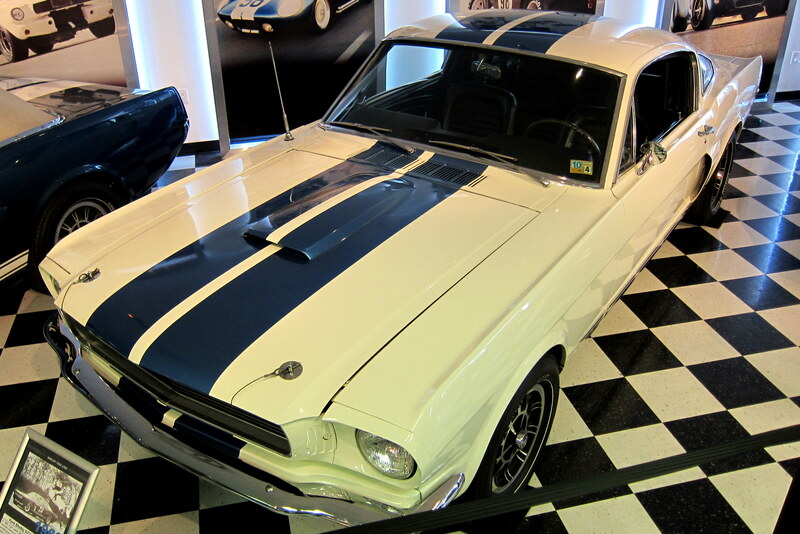 Looking at expanding his car manufacturing business and Ford Motor Company looking to provide excitement to the recently released Mustang, Carroll Shelby created the GT-350 out of stock factory supplied 1965 Mustangs. The name “350” came about by Carroll being exasperated by the Ford suits squabbling over a fitting name for the new high performance specialty vehicle. He finally asked how far it was to the corporate headquarters from the conference room they had spent most of the day in. When one of the Ford exec’s said about 350 yards…..Carroll said, “That’s the name…..I’m going out for a beer”. Shelby American is still a viable manufacturing business and produces a rolling chassis Cobra identified with a CSX (Carroll Shelby Experimental) Serial Number rather than a VIN (Vehicle identification Number) in order to dodge modern government safety requirements. When completed by the buyer, these machines retail for up to a quarter million dollars. And sticking with his Ford relationship, Shelby also makes a modern GT-350 as well as an unbelievable car called the Super Snake which features an 800 HP engine and turn-key ready for sale at around $80,000! We were allowed to access their attached manufacturing facility as well…..however the tour guide did not allow any photography. Both the Cobra factory and the Mustang assembly shops were immaculate and I spent quite a while watching the mechanics manufacture and assemble these incredible machines. While looking around the Mustang portion of the Shelby American shop, we noticed that there were a few cars being worked on that looked different than the others. The tour guide mentioned they were a new product that was going to be unveiled in April and couldn’t tell us any more about them…..perhaps that is why the no photography rule was imposed. 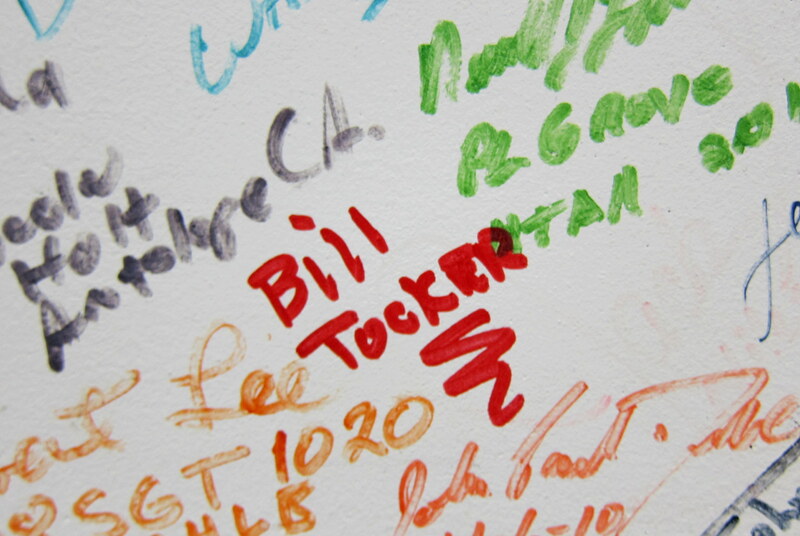 Every visitor to the Shelby American shop is invited to sign their name on the factory wall…..so I added my name to the thousands that have gone before me. 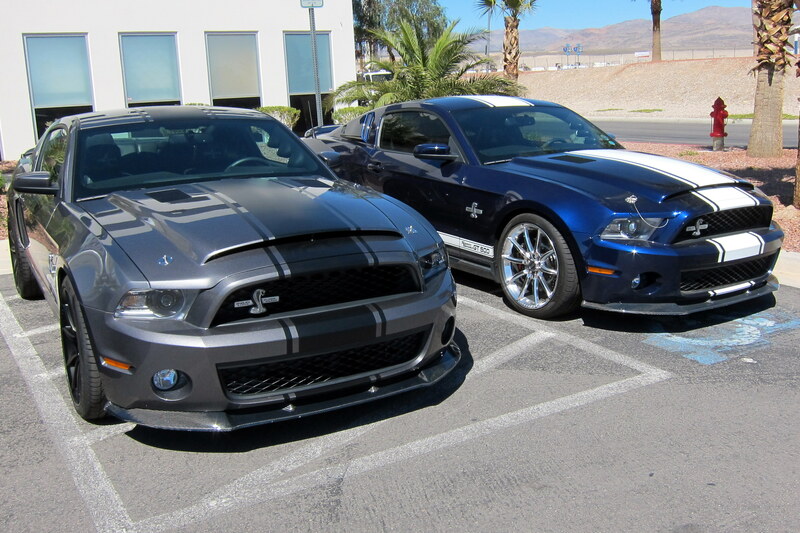 If you are a car nut, the Shelby American tour is free and a Las Vegas must see. Las Vegas tries to make the ubiquitous Cellular Tower blend in to the surrounding countryside as much as possible. 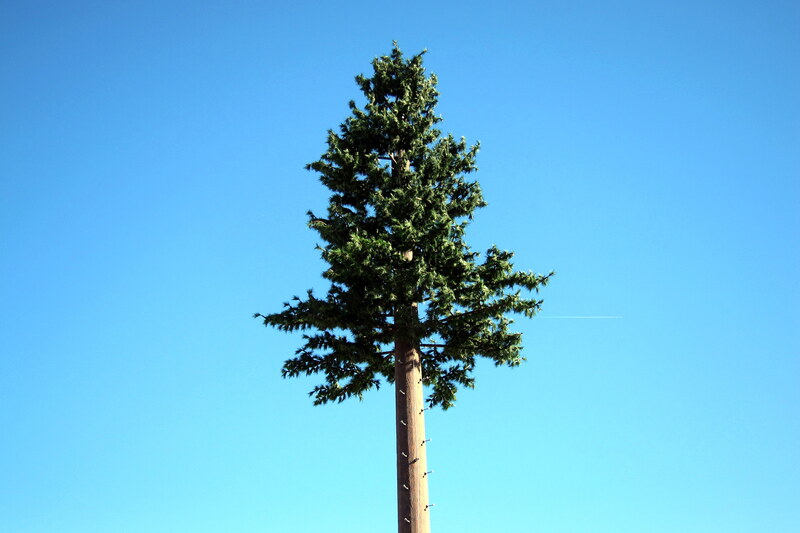 This particular cell tower is in South Vegas…..gee, I hardly noticed the fake pine tree amongst all the rest of the desert vegetation. 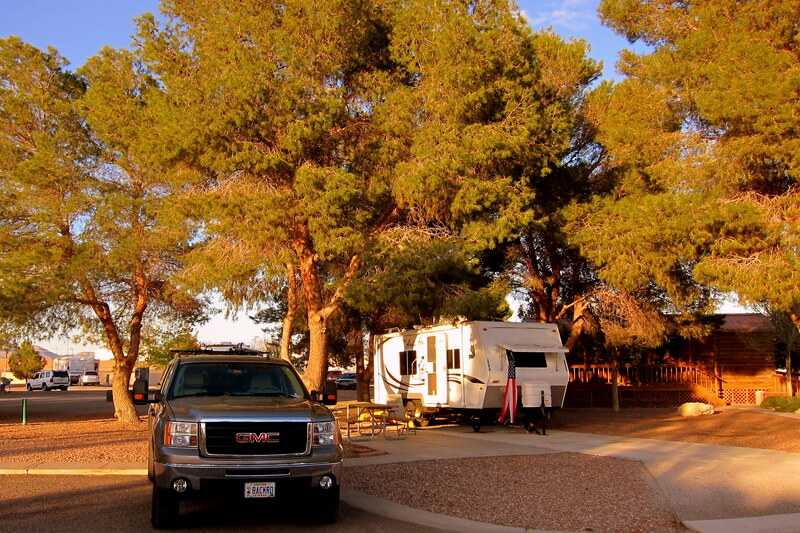 There are a number of ways to go from our campsite on the north side of town down to where the kid’s home is. 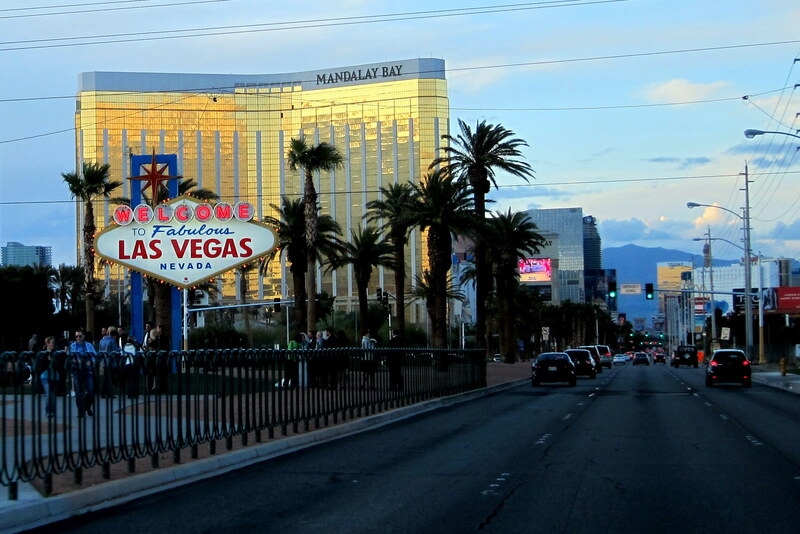 Either the turnpike, or the back roads through the neighborhoods east of downtown, or straight down Las Vegas Boulevard…..better known as The Strip. 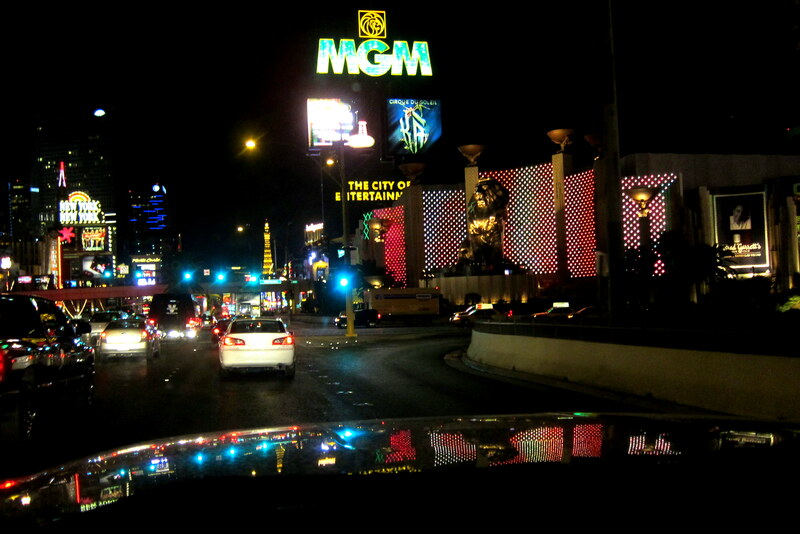 Since there is far more entertainment value by going down the strip, that turned into our preferred commuting route. It was especially entertaining at night, when thousands of folks walked from casino to bar to casino, etc. Kit really wanted to see the Donny and Marie show so one day we headed back down to the strip. However while waiting in line at the ticket office a sign went up that changed our plans. 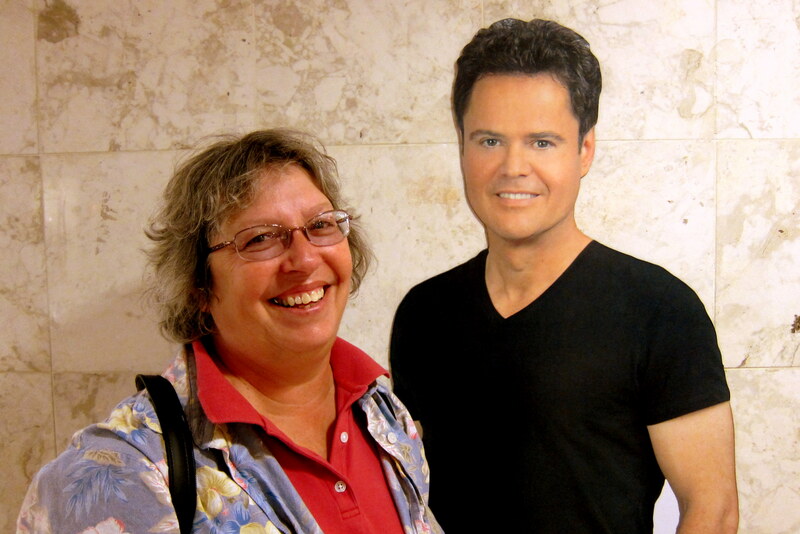 She was a bit disappointed but I was able to persuade Flat Donny to pose for a fan photo with her. He wasn’t talkative and his personality was a bit cardboard like, however Kit didn’t seem to mind…..she said Flat Donny was far more animated than me. Well…..since we were already downtown and I had learned of a rather unique used car lot nearby I guess one could say that the day was not a total loss. While Kit did some shopping I went off in search of the Imperial Palace, an older casino on the strip. Locating the place, I made my way to the fifth floor where approximately 200 antique and classic cars waited buyers flush with their gambling winnings. Make no mistake about it…..this is an actual used car business complete with salesmen and on site financing and vehicle registration. 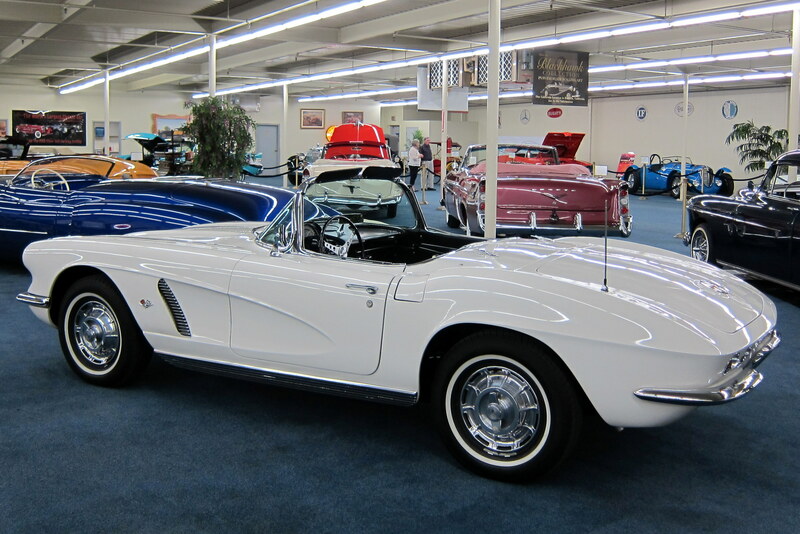 Below is just a small sampling of the cars offered for sale. 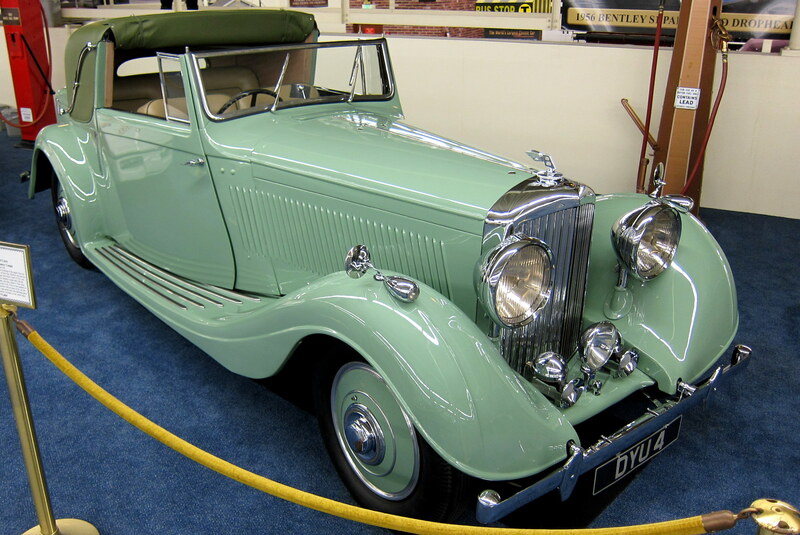 A 1937 Bentley Sedanca Coupe could be yours for only $475,000.00. 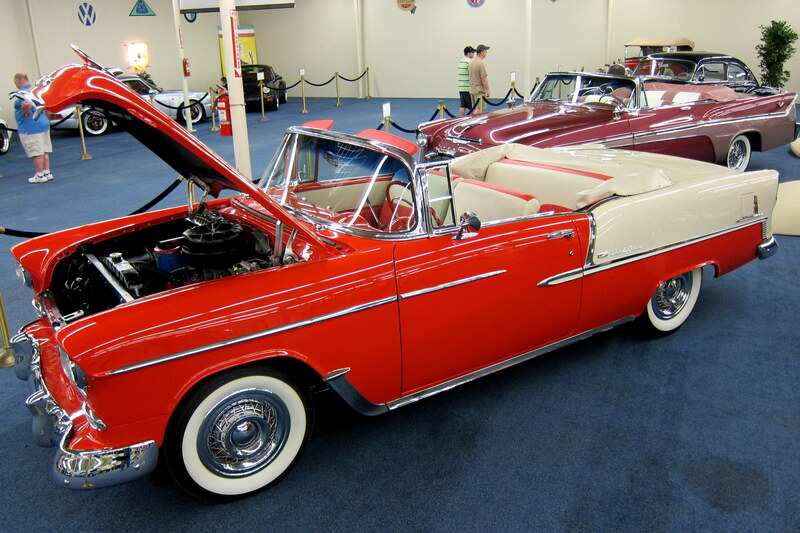 A 1955 Chevrolet Bel Air Convertible, a steal for $145,000.00. 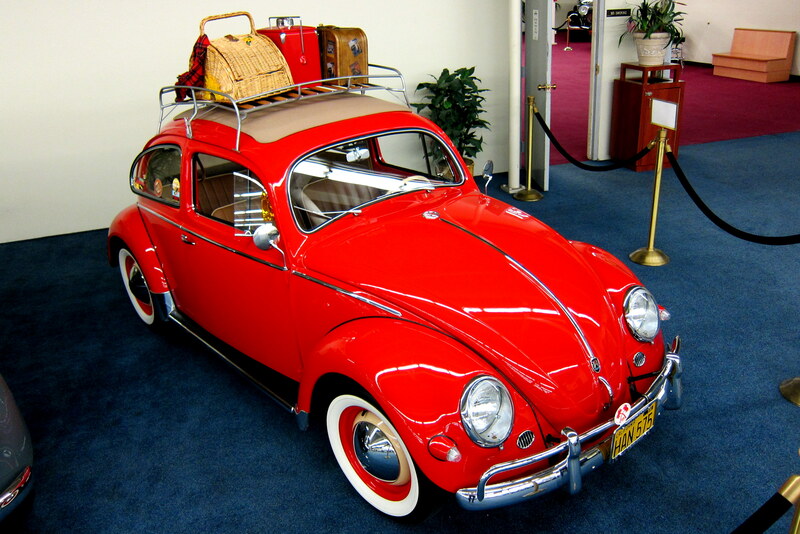 This one might get our old friend Randy excited…..a 1957 Volkswagen Beetle Ragtop for a mere $35,000.00! 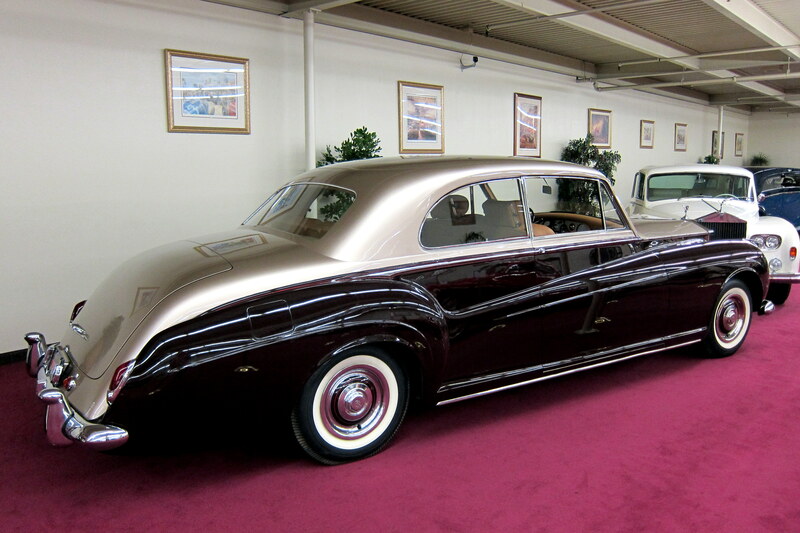 And the bargain of the lot…..a 1960 Rolls Royce, only $1,500,000.00. Since I had a little stashed away from my gambling winnings, I was particularly interested in this cream puff. 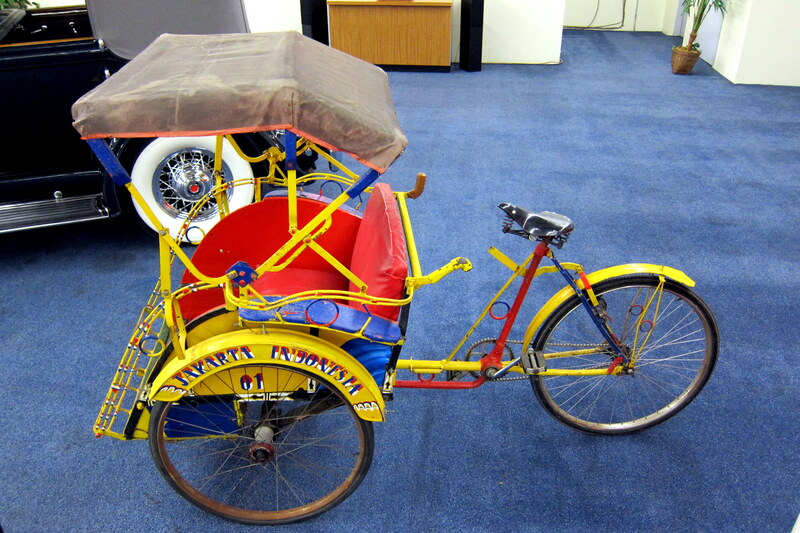 That’s a 1975 Jakarta Rickshaw folks and at only $500.00! Drat…..Kit said no. 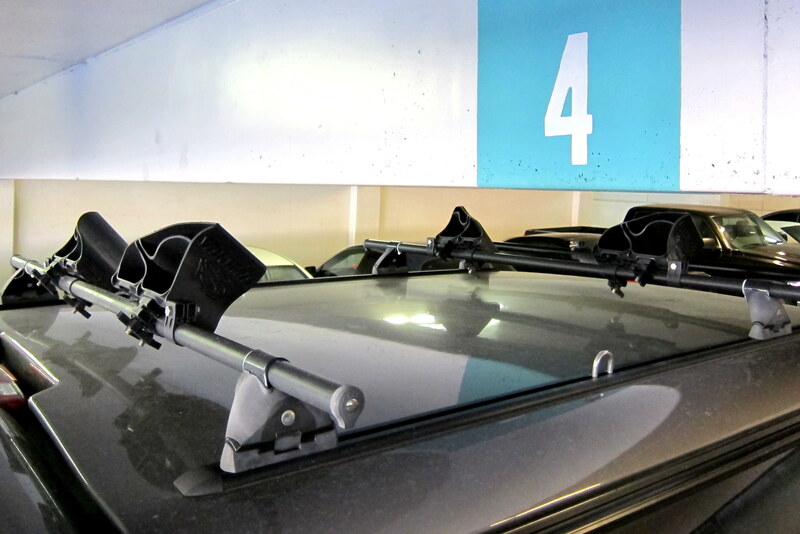 Leaving Las Vegas (hey…..that might make a nifty movie title), I encountered a particularly low portion of the Imperial Palace parking garage…..good thing I removed the kayak a few days earlier. You don’t think a journal would pass without a photo of food. 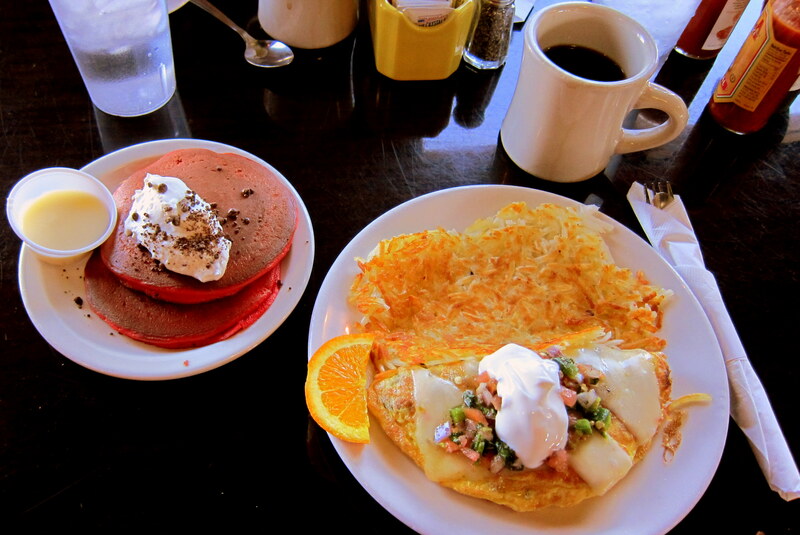 This incredible breakfast was enjoyed at a place called Baby Cakes…..that’s a Mexican omelet with chorizo and a short stack of Red Velvet pancakes…..it was as delicious as it looks! On another day, we took the kids to Town Square, a nifty shopping area made up to look like Anytown USA. After a fun time at California Pizza Kitchen we needed to run off some calories at the playground. 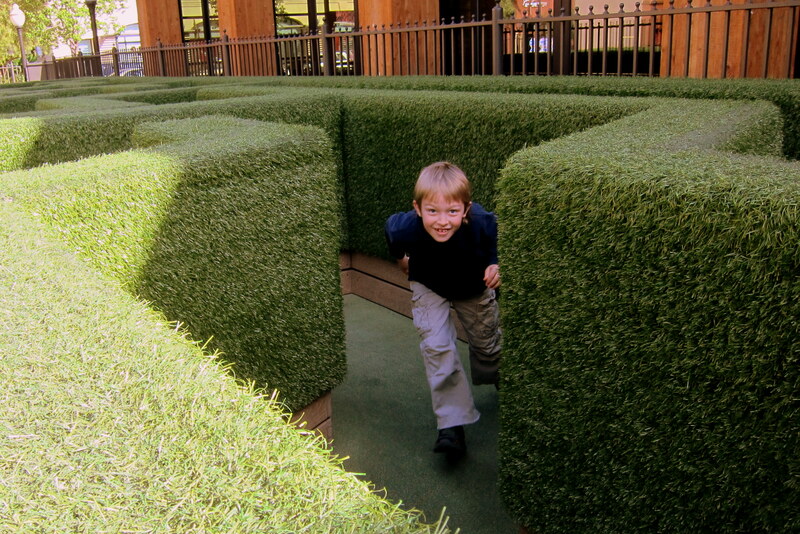 The kiddles had a blast hiding from Guma in the Hedge Maze. And enjoying the many opportunities to play make believe. 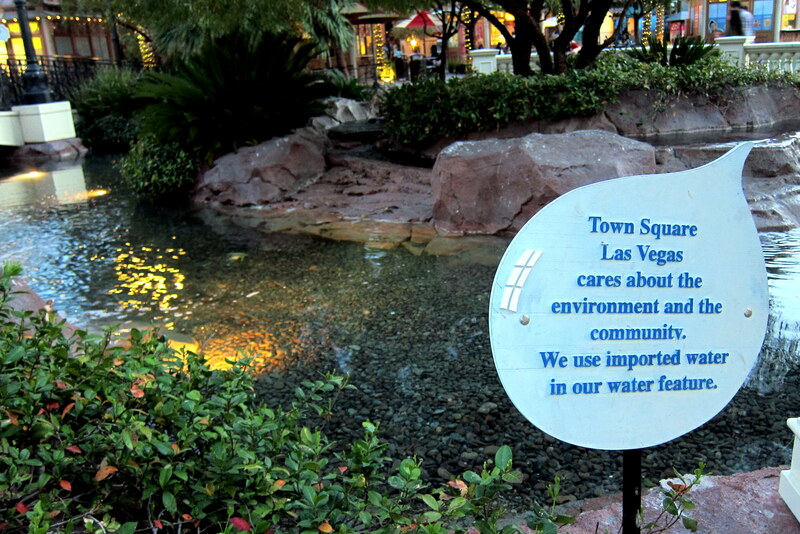 While walking about Town Square, I spotted this unusual sign. Pretty exclusive place when they can fill their fish pond with Perrier?!?! Well, all good things have to come to an end and we reluctantly had to return the kiddles home. 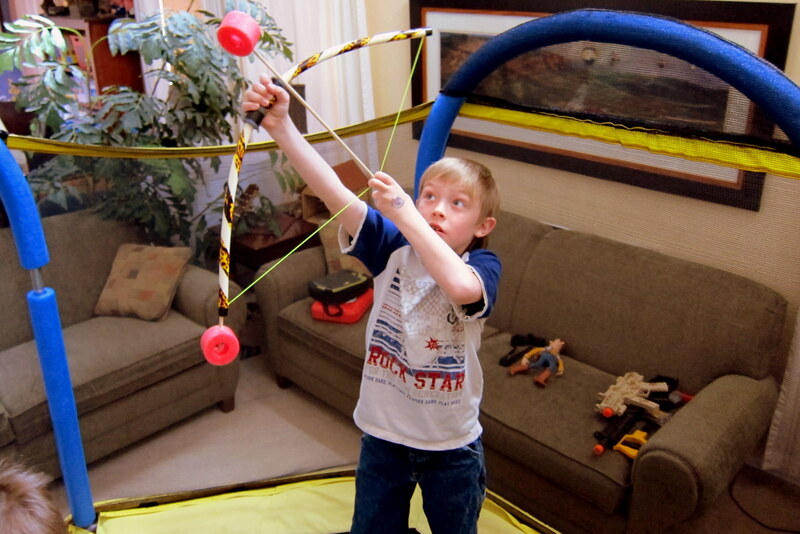 However, we were able to spend a few more hours with them watching their marksmanship at play by shooting arrows at the upstairs windows while bouncing on their living room installed trampoline. Boy, to be a kid in this day and age…..all I had to play with was myself, um…..so to speak. 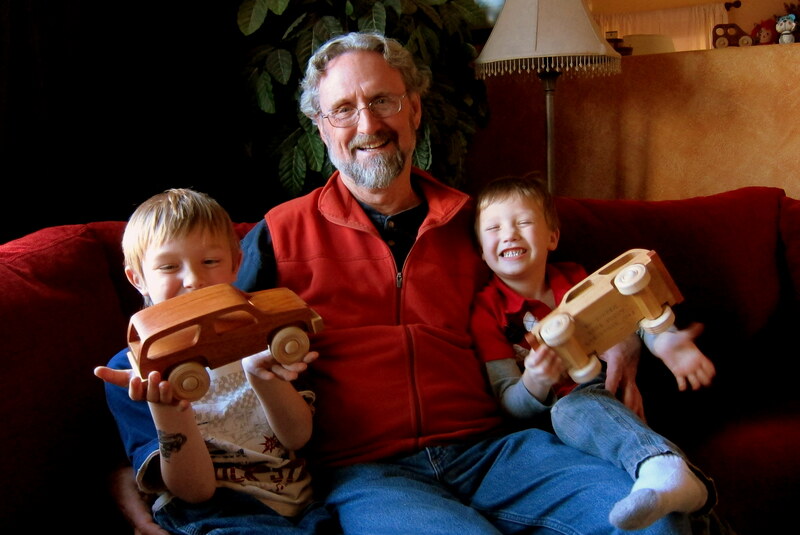 Every winter while home in Maine, I spend time in the workshop making wooden toys and furniture for the grandkids to receive at Christmas. Our three in Maine receive these gifts on time, but the two in Nevada have to wait until we make our way here. Well the other day was the unveiling. A couple of SUV’s just like their dads, wooden you know (pun intended)…..one made in Mahogany and the other made in Maple. 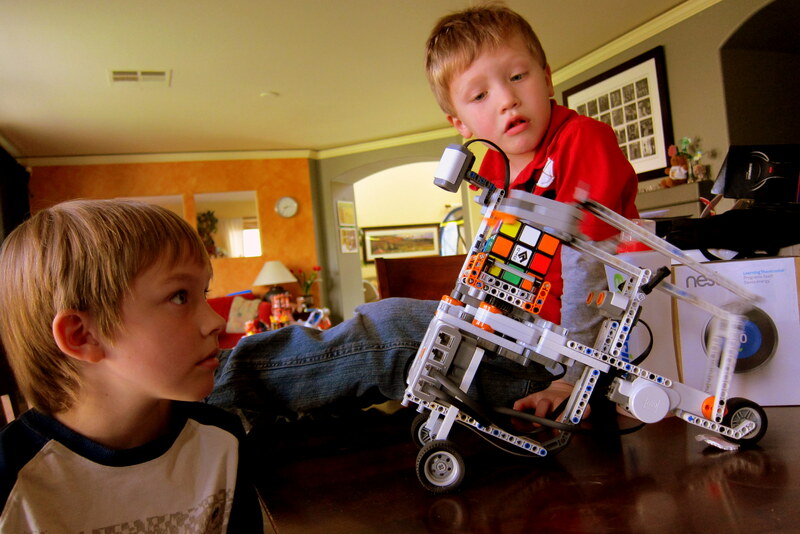 Also, while at the kid’s house we were able to enjoy a demonstration of the Lego Rubik Cube solving robot. This fantastic machine can analyze the cube, devise multiple ways to resolve it and then proceed to manipulate the cube so all the colors were together. A much more elegant way then I used to use…..peeling the colored squares off the cube and reapplying them with the appropriate colors on each of the six sides. 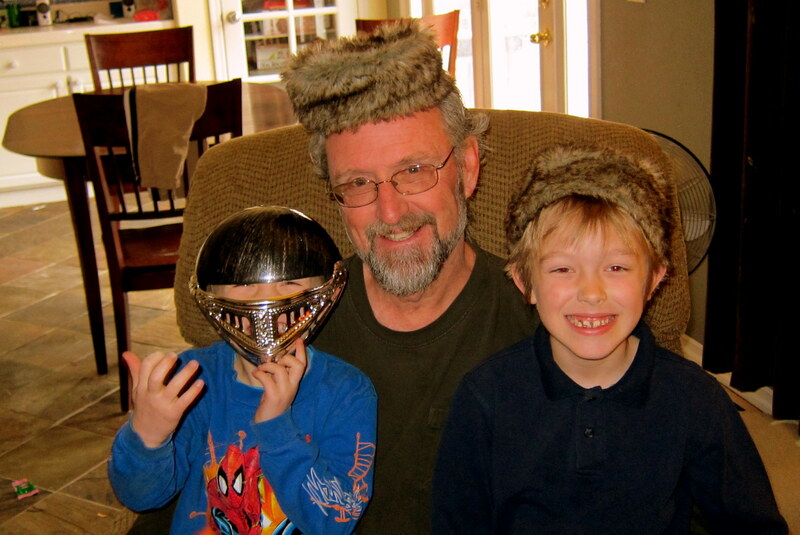 Later, all the kids in the house decided to get silly and don ridiculous hats…..sooooo, who looked the silliest? Just to go on record…..we also have three great older grandkids back in Maine who we get to see quite often. 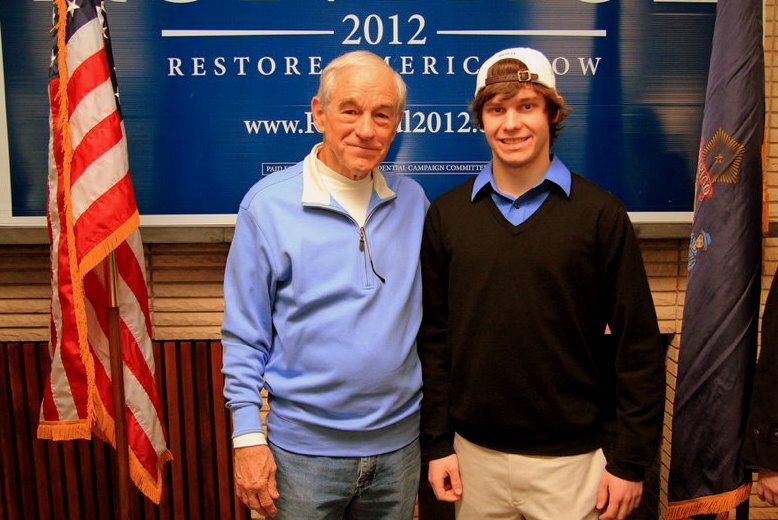 First there is Joe, Age 19 and a sophomore at the University of Maine. He is an avid outdoorsman and is readying himself for a trip this summer to Washington State and an assault on Mount Rainer. Being of voting age he has become quite politically active. Katie is 16 years old, a high school sophomore, and an excellent student and athlete playing on her schools soccer and lacrosse teams. 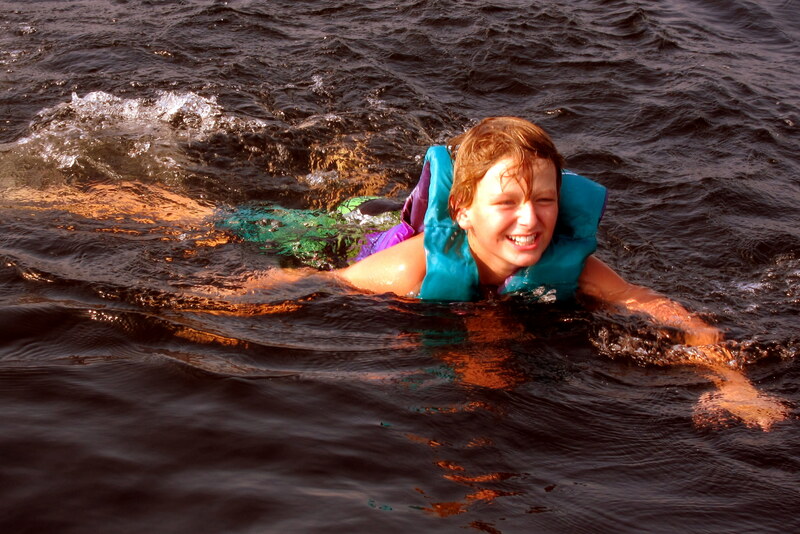 During the summer, she loves to hang with us at camp and enjoys fishing, kayaking, and water skiing. During the winter she is an avid snowmobiler and snowboarder. Oh…..and she is driving the boy’s crazy, which in turn, drives her dad crazy. She also got her driver’s license recently so is on the road most days. CJ, age 12, is in Middle School and is also an excellent student athlete. He excels in soccer, lacrosse and basketball, winning the free throw competition for his town. He too enjoys winter sports as well as visiting with Guma and Poppy at the family lakeside camp. We are immensely proud of all our grandchildren and enjoy spending time with them. 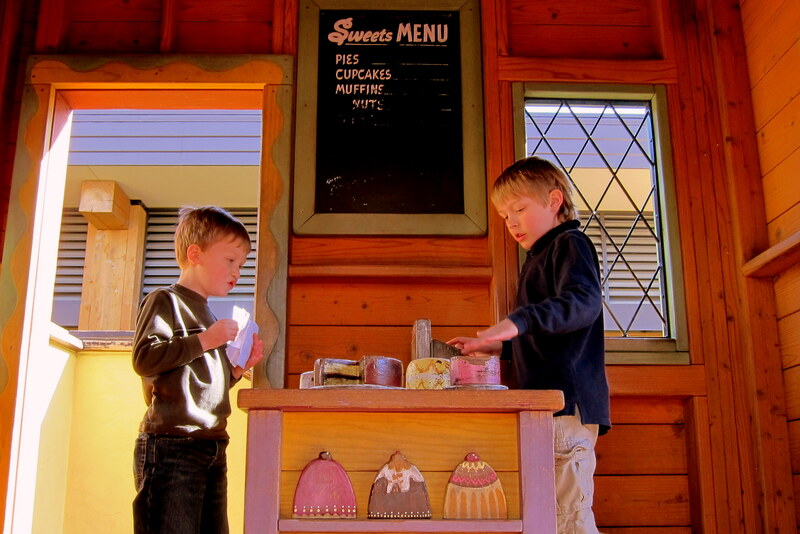 In fact, had we known they were going to be so much fun…..we would have had them first! 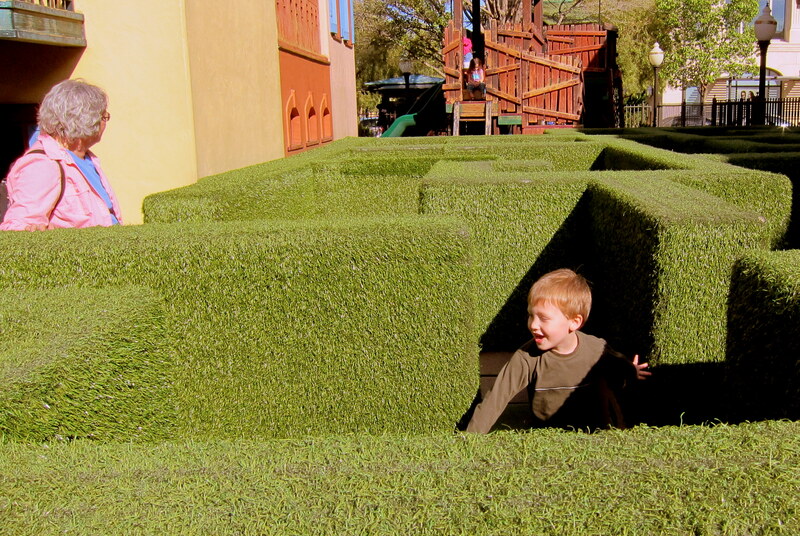 Kit’s Corner: I’m not sure who had more fun during our time in Las Vegas, us or the grand kids. 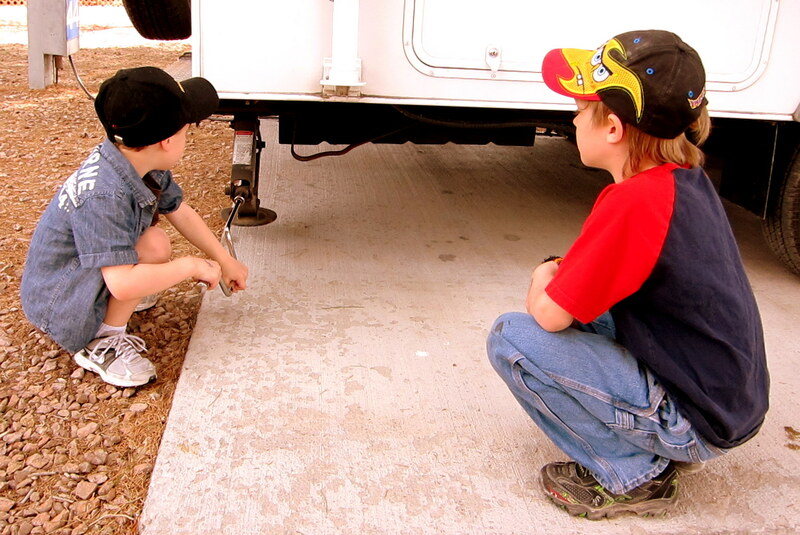 We love to have them hang out with us in the camper and they love hanging with us. Both Jack and Tucker are growing up so fast, as are our other three Maine grand kids. We feel incredibly fortunate to have special times with each of the grands and hope they have fond memories of their old geezer grandparents that they can share with their family and friends. You know how to do things right! I especially love to see you both enjoy your grandkids and family. Our FL stay, one month, is just too short. We’ve signed up for 3 months next year. We enjoyed a Red Sox game this week. You always take interesting but sometimes questionable photos — well I have one for you. I’ll send it via email. Thanks for the comment and the nice words. I kinda live an interesting but sometimes questionable life, so I guess it goes it comes natural! Neat photo…..talk about gender confusion!?!? Loved seeing the “three kids” enjoying themselves. Concerned that this left Kit with most of the work. we are enjoying our time in Texas. However, the time to head home is approaching quickly. We will be leaving here in about 2 weeks. Your posts are terrific! Keep them coming. Will do, and you as well! Have a safe and enjoyable trip back home to Minnesota. Thanks for the nice comment. Yea, as a certified car nut, I went wild at the oppertunity to see all those cool automobiles! Hopefully next trip we can make it to California and see you…..stay safe! Glad to see the 3 “boys” enjoying cars, planes, and “rollie slide”. The cars you made are “classic”, Bill. Nice to see the pics of Joe, Katie, & Chris, too. All 5 are growing up too fast…but then , aren’t we all (or at least old). Really enjoy all of your posts and hope to soon do some of the same (or similar). See you soon in Maine. To Gerry and Denise…next year we HAVE to get together down here. Thanks…..we are technically on our way home, however the way we travel it will take another month. Looking forward to seeing you on the pond! Have a safe and enjoyable trip home in that fancy new red Ford F-150! This HAS to be known as the “automobile” issue. Great job Bill. Since this posting was dated through the 22nd of March, I suspect you are half way home by now. See you guys soon. Thanks for the nice comment, and thanks for all the help in identifying my bird photo’s. I guess we are halfway home, mileage wise…..however we have a lot of exploring left to do so will likely be on the road for another month or so. Looking forward to seeing you guys back home in Maine. Have a safe and enjoyable trip north! HEY! WHAT AN INTERESTING JOURNAL. THE BEAUTIFUL RED 55 CHEV BELONGED TO MY SWEETHEART FROM TRENTON WHEN I WAS IN BOOTCAMP AT FT. DIX NJ. JANUARY 55. NO QUESTION THESE ARE MEMORIES THAT WILL LAST YOU, KIT AND THE REST OF THE FAMILY MANY LIFETIMES. Thanks…..the experiences are great and the memories should be even better. Um, does Jeanne know about your New jersey sweetheart? Don’t worry, your secret is safe on this blog. when you were at the Shelby place, did you tell them about your Uncle Preston. Might have been worth a discount. 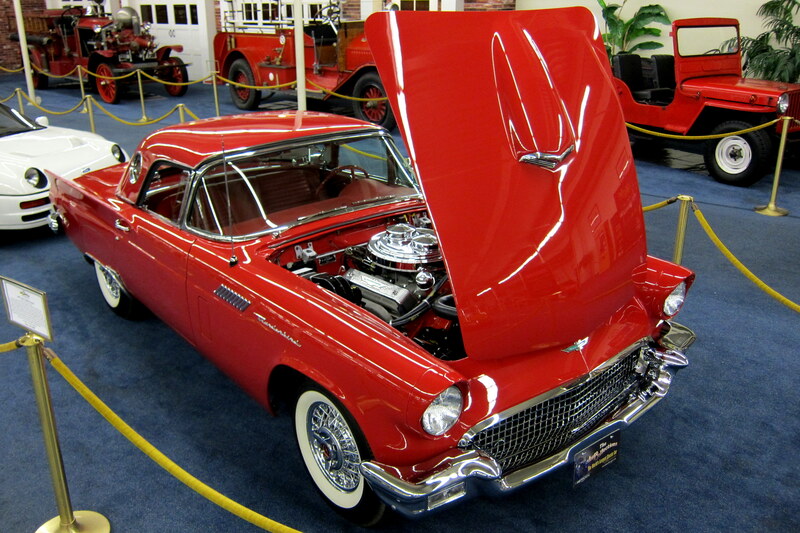 No, however I should have…..or, maybe I should have mentioned the Tucker car that I own! Might have been able to affect a trade! !